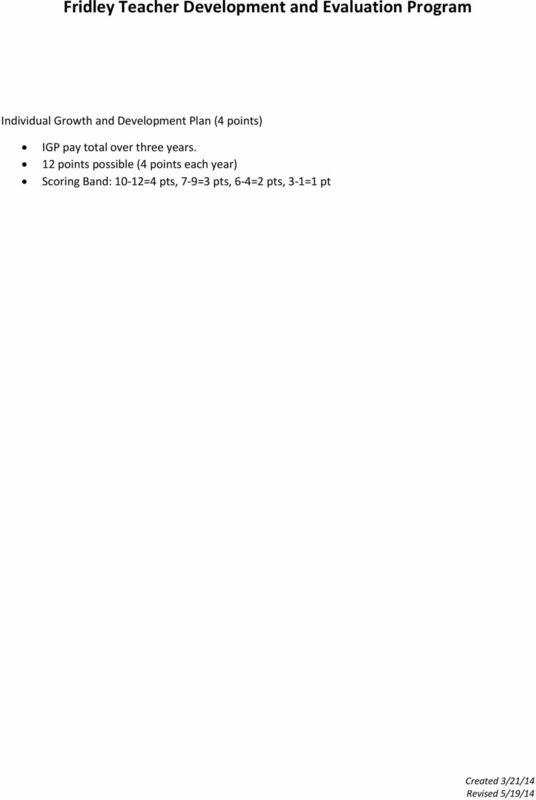 Download "Fridley Alternative Compensation Plan Executive Summary"
2 Component 3. 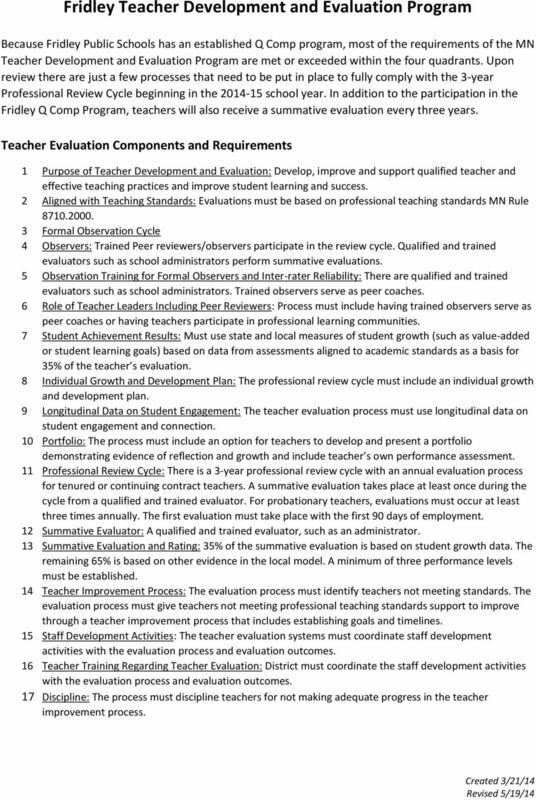 Teacher Evaluations Teachers may earn up to $500 based upon classroom observations and evaluations. Observations and evaluations are based upon Charlotte Danielson s Enhancing Professional Practice domains. Up to $125 may be earned in each of the domains of Planning and Preparation, Classroom Environment, Instruction, and Professional Responsibility. A point system is used in each domain based upon the categories of unsatisfactory, basic, proficient, and distinguished. (Categories may vary slightly for specialists.) Teacher earnings are calculated on a numeric value assigned to each domain. Component 4. 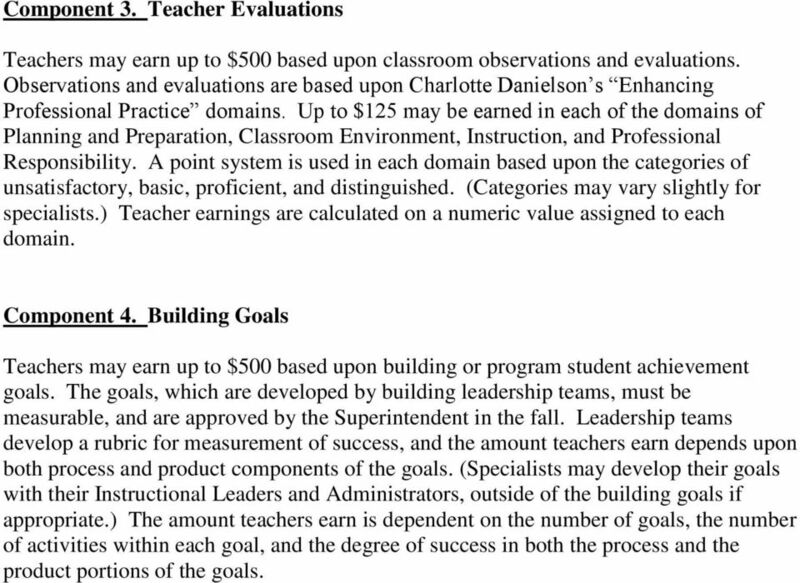 Building Goals Teachers may earn up to $500 based upon building or program student achievement goals. The goals, which are developed by building leadership teams, must be measurable, and are approved by the Superintendent in the fall. 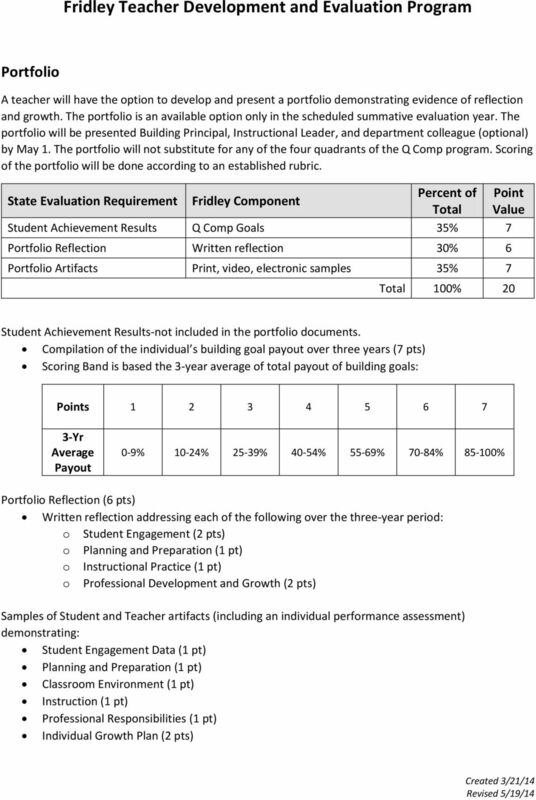 Leadership teams develop a rubric for measurement of success, and the amount teachers earn depends upon both process and product components of the goals. (Specialists may develop their goals with their Instructional Leaders and Administrators, outside of the building goals if appropriate.) The amount teachers earn is dependent on the number of goals, the number of activities within each goal, and the degree of success in both the process and the product portions of the goals. 3 Fridley Alternative Compensation Plan Additional Information Four Components of Fridley s Alternative Compensation Plan Component 1. Professional Development Component The professional development component is based on participation and attendance. A tentative professional development calendar will be developed prior to the school year, given to staff, and followed as closely as possible, with the understanding that situations may arise where dates or topics may need to be changed. Attendance will be taken and recorded throughout the year. Because of the participatory nature of the professional development sessions and the difficulty in following up with high quality make-up sessions, it is expected that teachers attend. 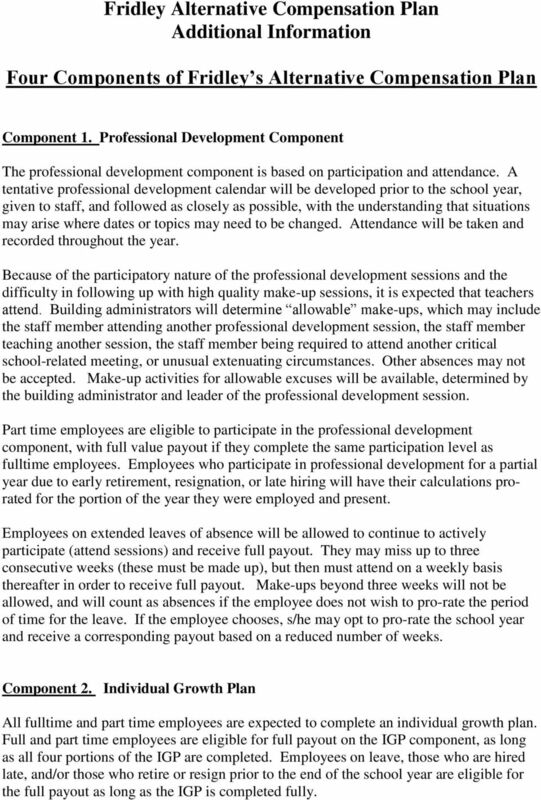 Building administrators will determine allowable make-ups, which may include the staff member attending another professional development session, the staff member teaching another session, the staff member being required to attend another critical school-related meeting, or unusual extenuating circumstances. Other absences may not be accepted. Make-up activities for allowable excuses will be available, determined by the building administrator and leader of the professional development session. Part time employees are eligible to participate in the professional development component, with full value payout if they complete the same participation level as fulltime employees. Employees who participate in professional development for a partial year due to early retirement, resignation, or late hiring will have their calculations prorated for the portion of the year they were employed and present. Employees on extended leaves of absence will be allowed to continue to actively participate (attend sessions) and receive full payout. They may miss up to three consecutive weeks (these must be made up), but then must attend on a weekly basis thereafter in order to receive full payout. Make-ups beyond three weeks will not be allowed, and will count as absences if the employee does not wish to pro-rate the period of time for the leave. If the employee chooses, s/he may opt to pro-rate the school year and receive a corresponding payout based on a reduced number of weeks. Component 2. Individual Growth Plan All fulltime and part time employees are expected to complete an individual growth plan. Full and part time employees are eligible for full payout on the IGP component, as long as all four portions of the IGP are completed. Employees on leave, those who are hired late, and/or those who retire or resign prior to the end of the school year are eligible for the full payout as long as the IGP is completed fully. 5 manner, within 10 working days of the observation. Because some scoring may occur at the post conference during the discussion, and on occasion certain areas may be agreed upon for development, a preliminary scoring will be given at the post conference, or shortly thereafter. Final scoring may occur later in instances where the teacher is working on development in a particular area of the rubric. 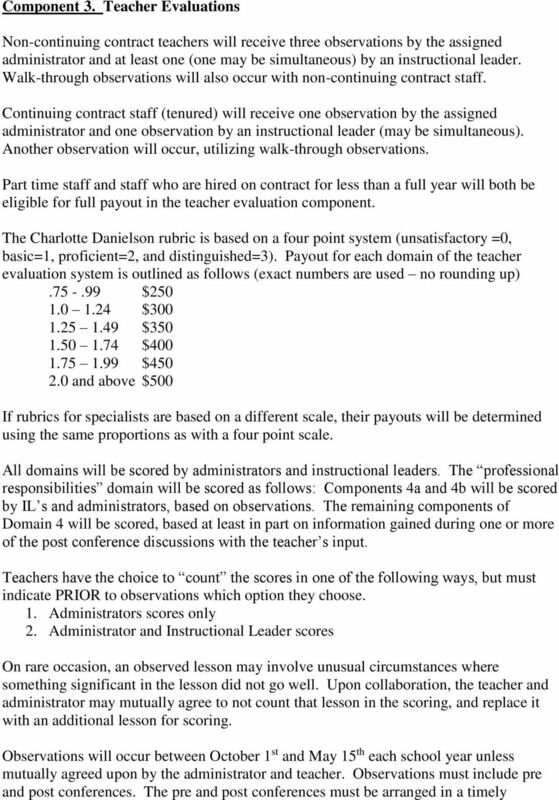 Administrators and Instructional Leaders (IL s) will be trained in the Charlotte Danielson model, and will annually receive re-training and practice in observation and conferencing and coaching skills in order to increase inter-rater reliability. In addition, IL s will not be involved in actions that may result in teacher discipline due to teacher observations. Component 4. Building Goals Full and part time employees are expected to participate in building or program student achievement goals. 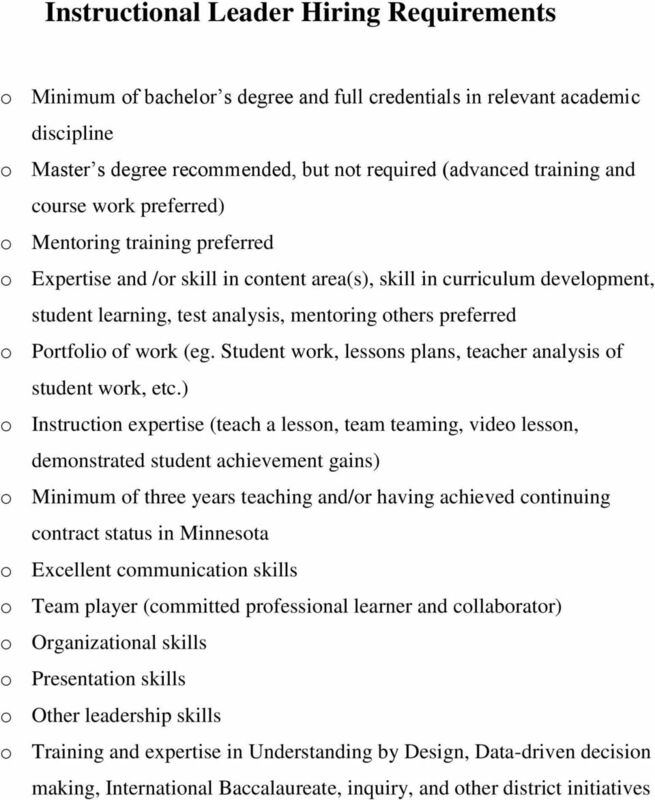 The student achievement goals are developed by program or site, with input from the assigned administrator, the leadership teams, and/or individuals. 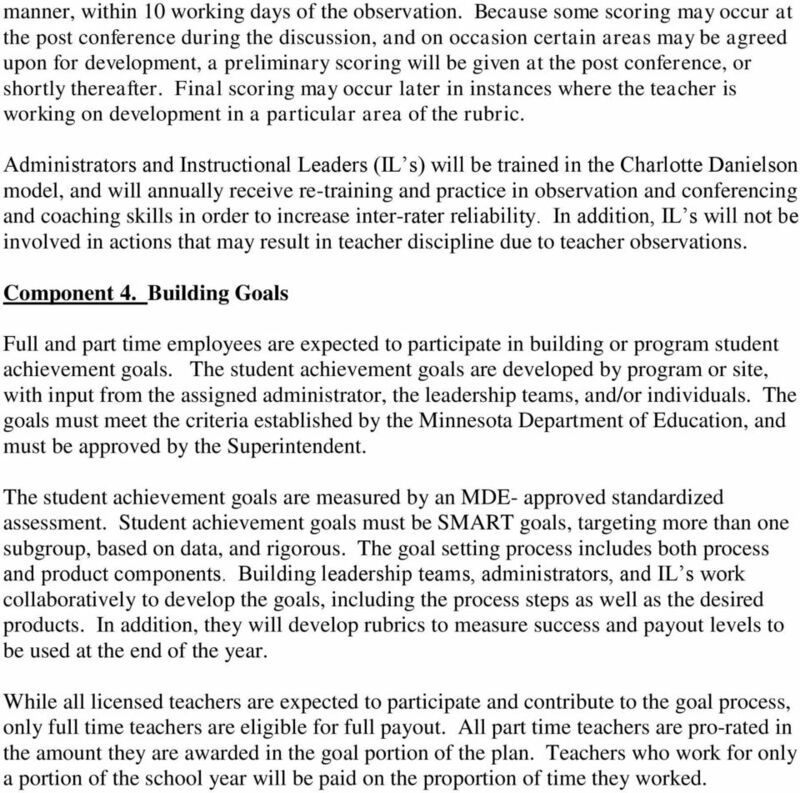 The goals must meet the criteria established by the Minnesota Department of Education, and must be approved by the Superintendent. The student achievement goals are measured by an MDE- approved standardized assessment. Student achievement goals must be SMART goals, targeting more than one subgroup, based on data, and rigorous. The goal setting process includes both process and product components. Building leadership teams, administrators, and IL s work collaboratively to develop the goals, including the process steps as well as the desired products. 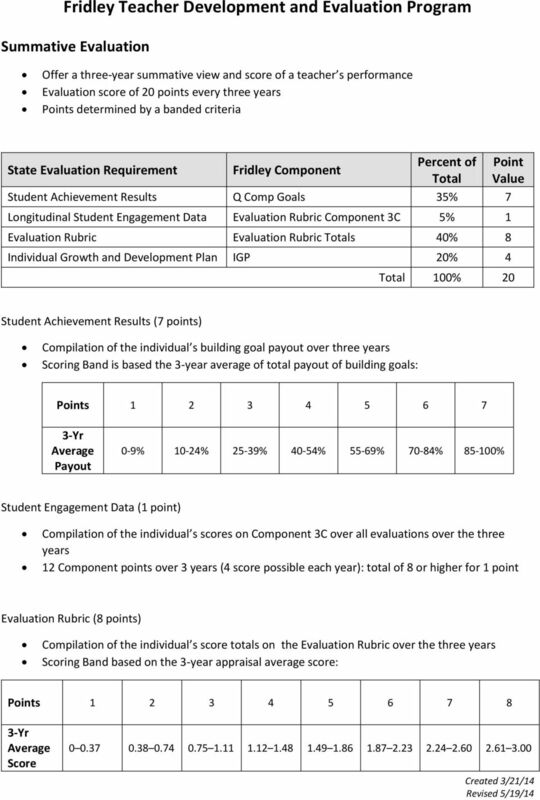 In addition, they will develop rubrics to measure success and payout levels to be used at the end of the year. While all licensed teachers are expected to participate and contribute to the goal process, only full time teachers are eligible for full payout. All part time teachers are pro-rated in the amount they are awarded in the goal portion of the plan. Teachers who work for only a portion of the school year will be paid on the proportion of time they worked. 7 in the school district. Selections made by the interview team will be forwarded to the Superintendent for hiring recommendation. Interview teams may be organized by school levels in the district, with the most practical division being an elementary interview team and a secondary interview team (middle school, high school, and ALC). District ACP Committee A district ACP committee will meet as needed to as an oversight group for the overall Alternative Compensation Plan, to deal with state mandates, proposed changes to the plan, periodic review of the plan, and resolve other issues related to the plan that may arise. Makeup of the committee shall include representatives of the district and building administration and teachers, with a makeup of at least as many teachers as administrators. The FEA President will determine the teaching representatives, and Superintendent will assign administrators. 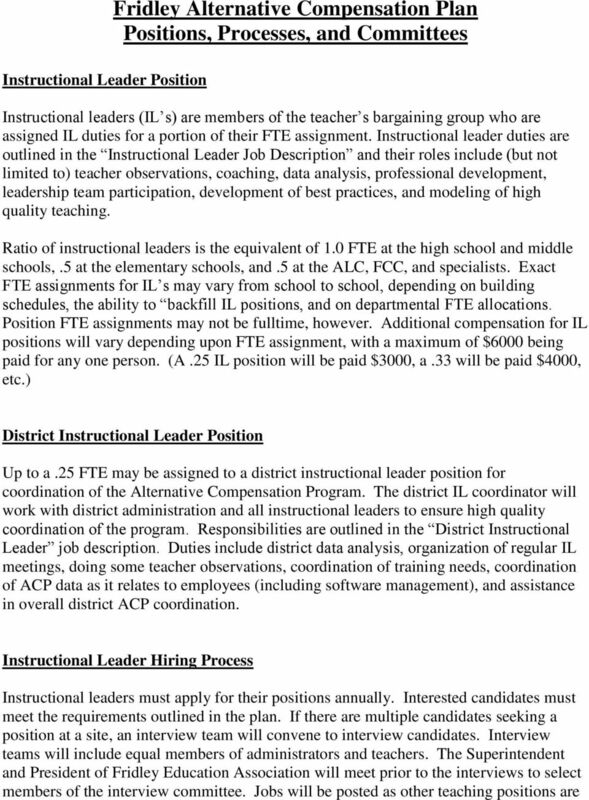 Hiring Committee Hiring Committees will be formed annually in the spring to interview candidates applying for the Instructional Leaders positions. The hiring committees may be organized by school level (typically elementary and secondary), or a single hiring committee may be formed, depending on the number of candidates and the needs. Representation on any hiring committee will include both teachers and administrators, with equal members of each group on the committees. The President of Fridley Education Association and the Superintendent will meet prior to the interview process to agree upon the makeup of the committees, with each recommending participants from his/her respective group. Appeals Committee An Appeals Committee will be formed if an appeal arises which cannot be resolved. Appeals may be made for scoring process errors only, and appeals based on subjective scoring decisions will not be considered. The guidelines below will be followed when dealing with appeals. Any eligible employee denied any portion or part of the compensation has the right to a timely appeal of the decision. 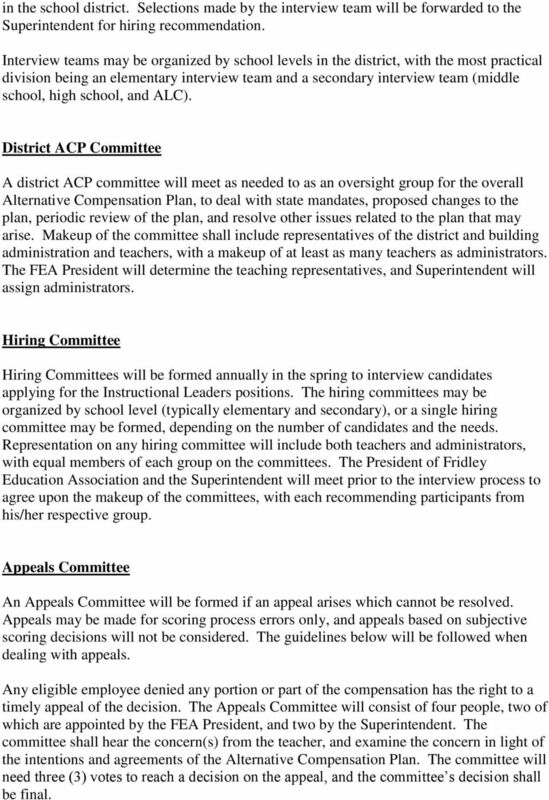 The Appeals Committee will consist of four people, two of which are appointed by the FEA President, and two by the Superintendent. The committee shall hear the concern(s) from the teacher, and examine the concern in light of the intentions and agreements of the Alternative Compensation Plan. The committee will need three (3) votes to reach a decision on the appeal, and the committee s decision shall be final. 8 The appealing employee must request an appeal in writing within ten days of the time the employee was notified of the denial of any or all parts of the compensation. The committee shall set a time to hear the appeal within fifteen days of the written request, and within five days of the hearing, the Appeals Committee will communicate its decision. The makeup of the committee, while determined by the FEA President and the Superintendent, will be made up of teachers and administrators from buildings other than that of the appealing teacher. Peer Observation Process Beginning in , teachers will have the optional opportunity to do up to two peer observations of other teachers. 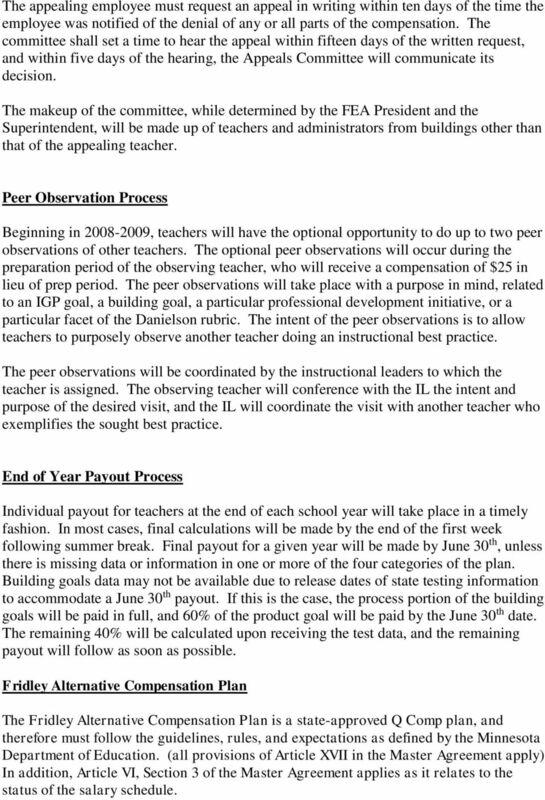 The optional peer observations will occur during the preparation period of the observing teacher, who will receive a compensation of $25 in lieu of prep period. 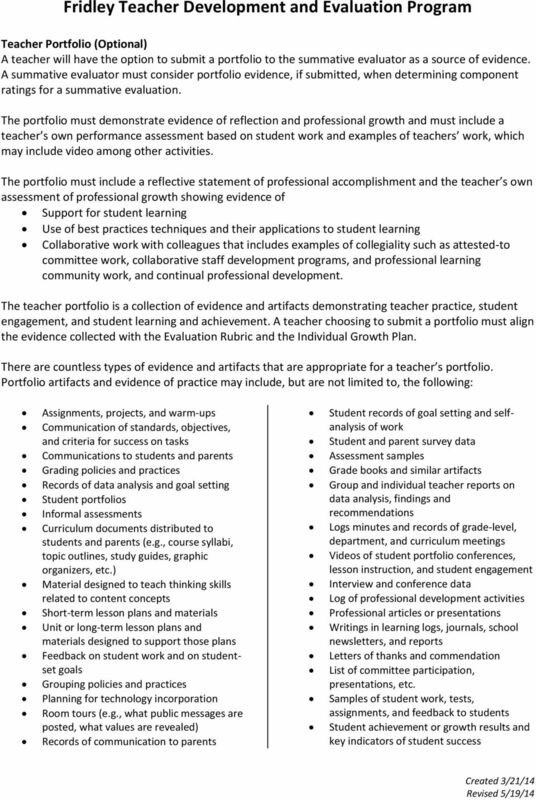 The peer observations will take place with a purpose in mind, related to an IGP goal, a building goal, a particular professional development initiative, or a particular facet of the Danielson rubric. The intent of the peer observations is to allow teachers to purposely observe another teacher doing an instructional best practice. The peer observations will be coordinated by the instructional leaders to which the teacher is assigned. The observing teacher will conference with the IL the intent and purpose of the desired visit, and the IL will coordinate the visit with another teacher who exemplifies the sought best practice. End of Year Payout Process Individual payout for teachers at the end of each school year will take place in a timely fashion. In most cases, final calculations will be made by the end of the first week following summer break. Final payout for a given year will be made by June 30 th, unless there is missing data or information in one or more of the four categories of the plan. Building goals data may not be available due to release dates of state testing information to accommodate a June 30 th payout. If this is the case, the process portion of the building goals will be paid in full, and 60% of the product goal will be paid by the June 30 th date. The remaining 40% will be calculated upon receiving the test data, and the remaining payout will follow as soon as possible. 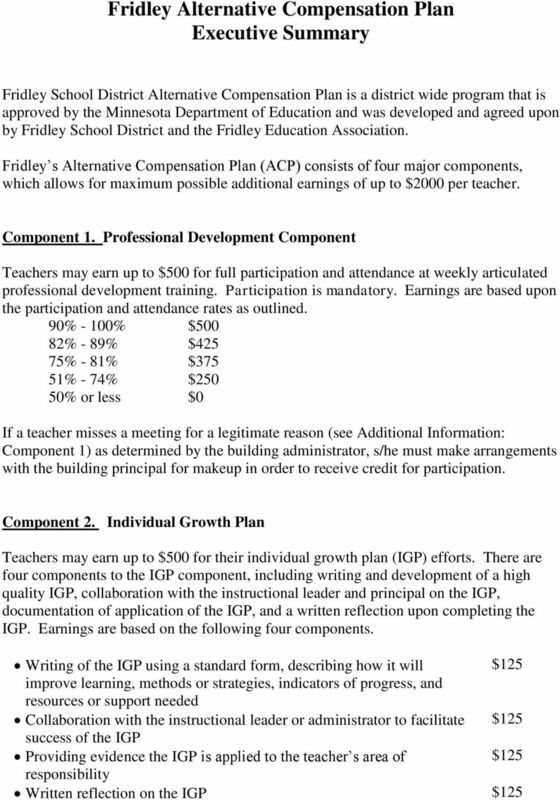 Fridley Alternative Compensation Plan The Fridley Alternative Compensation Plan is a state-approved Q Comp plan, and therefore must follow the guidelines, rules, and expectations as defined by the Minnesota Department of Education. (all provisions of Article XVII in the Master Agreement apply) In addition, Article VI, Section 3 of the Master Agreement applies as it relates to the status of the salary schedule. 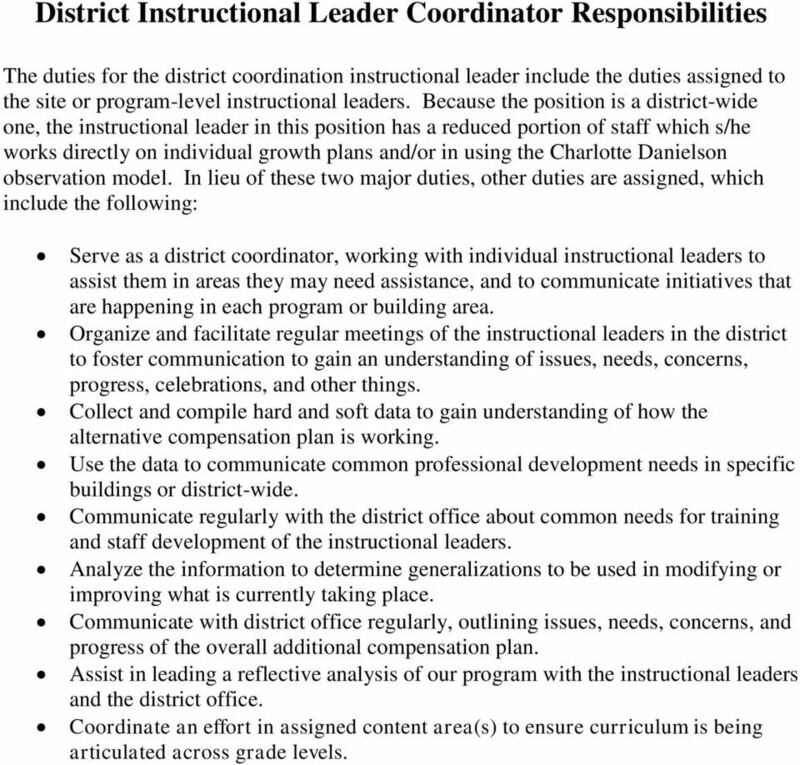 11 District Instructional Leader Coordinator Responsibilities The duties for the district coordination instructional leader include the duties assigned to the site or program-level instructional leaders. 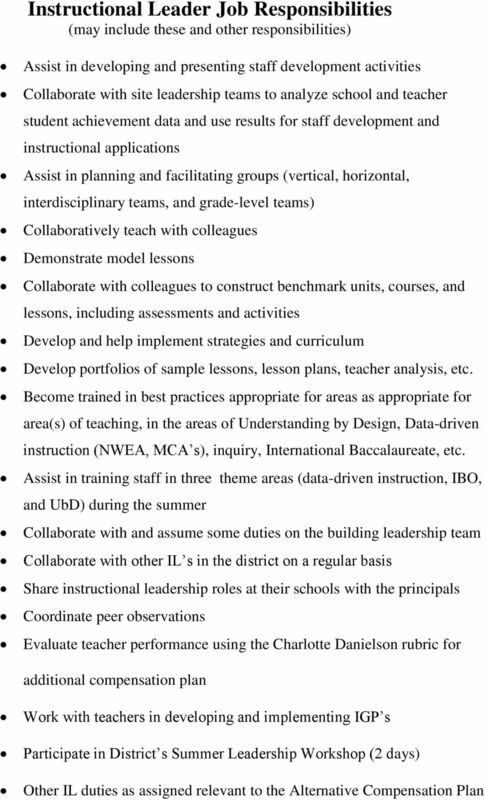 Because the position is a district-wide one, the instructional leader in this position has a reduced portion of staff which s/he works directly on individual growth plans and/or in using the Charlotte Danielson observation model. In lieu of these two major duties, other duties are assigned, which include the following: Serve as a district coordinator, working with individual instructional leaders to assist them in areas they may need assistance, and to communicate initiatives that are happening in each program or building area. Organize and facilitate regular meetings of the instructional leaders in the district to foster communication to gain an understanding of issues, needs, concerns, progress, celebrations, and other things. Collect and compile hard and soft data to gain understanding of how the alternative compensation plan is working. Use the data to communicate common professional development needs in specific buildings or district-wide. Communicate regularly with the district office about common needs for training and staff development of the instructional leaders. Analyze the information to determine generalizations to be used in modifying or improving what is currently taking place. Communicate with district office regularly, outlining issues, needs, concerns, and progress of the overall additional compensation plan. Assist in leading a reflective analysis of our program with the instructional leaders and the district office. Coordinate an effort in assigned content area(s) to ensure curriculum is being articulated across grade levels. HOUSE BILL 1981. State of Washington 64th Legislature 2015 Regular Session. Read first time 02/04/15. Referred to Committee on Education. Ch. 354 PROFESSIONAL EDUCATORS 22 CHAPTER 354. PREPARATION OF PROFESSIONAL EDUCATORS Sec. 354.1. Definitions. 354.2. Purpose. GENERAL PROVISIONS GENERAL 354.11. Minimum requirements for approval. 354.12. ARTICLE IV SALARIES. 1. Longevity pay will only be in Classes IV and V.
Through numerous meetings and continuous research and discussion, the following plan was developed to reach our vision.